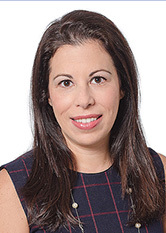 Arete "Arlene" Koutras advises clients in connection with a wide range of real estate matters with a focus on the representation of institutional lenders in the financing of commercial and multifamily properties and the sale of those loans to Fannie Mae and Freddie Mac. Ms. Koutras also has experience with portfolio and cross-collateralized loans at a national level and other loans involving affordable housing/subsidies complex structures, ground leases, master leases, state housing finance agencies, local municipalities, defeasance, and low income housing tax credits. Represented a community development financial institution in connection with a loan to finance the renovation and rehabilitation of nine (9) scattered site buildings in Brooklyn, New York. Additional subsidy provided by HPD under the Multifamily Preservation Loan Program (MPLP). Represented a nationally recognized bank in connection with a construction loan to a Pennsylvania limited partnership to finance the new construction of senior housing apartments and a new community center in Allegheny County, PA. Represented a nationally recognized bank as letter of credit provider in a bond transaction to finance a 116 unit new construction apartment building in Riverhead, New York. Represented a nationally recognized bank in connection with the financing of the new construction of a 66 unit workforce housing development on two sites with 9% tax credits and various state and local subsidies. Represented a nationally recognized bank in connection with the refinancing of 5 multifamily portfolios in the Mount Hope section of the Bronx, New York. HDC as primary lender with nationally recognized bank taking a 100% participation interest in HDC’s loan during construction phase. Additional subsidy loans made by HPD under the LIHTC Preservation (Year 15) Program. Represented a nationally recognized bank in connection with a loan to finance the acquisition of a hospital and acute care facility in New Jersey. $18M term loan and $10M secured working capital line of credit. Represented a cooperative housing lender in connection with loans to refinance the underlying mortgage on cooperative buildings throughout New York City. Loans consisted of term loans and revolving lines of credit. Named among the "2018 Women in Real Estate" by New York Real Estate Journal.